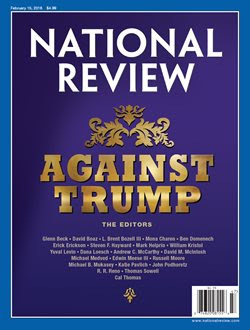 The editors of the influential conservative magazine National Review came out against Donald Trump. Donald Trump leads the polls nationally and in most states in the race for the Republican presidential nomination. There are understandable reasons for his eminence, and he has shown impressive gut-level skill as a campaigner. ... On foreign policy, Trump is a nationalist at sea. Sometimes he wants to let Russia fight ISIS, and at others he wants to “bomb the sh**” out of it. He is fixated on stealing Iraq’s oil and casually suggested a few weeks ago a war crime — killing terrorists’ families — as a tactic in the war on terror. For someone who wants to project strength, he has an astonishing weakness for flattery, falling for Vladimir Putin after a few coquettish bats of the eyelashes from the Russian thug. All in all, Trump knows approximately as much about national security as he does about the nuclear triad — which is to say, almost nothing.